Though former United States President Jimmy Carter is 92 years old, he is still paving the way for a brighter future. 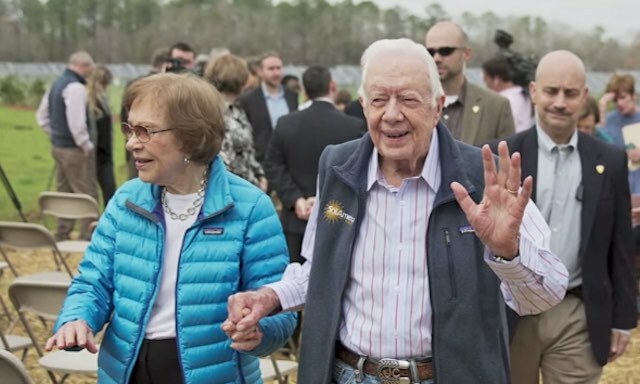 Mr. Carter, who ascended to the presidency 40 years ago, leased out 10 acres of his property in Plains, Georgia in February to be used as a solar farm for the city. According to SolAmerica (the renewable energy company that engineered and installed the single-axis tracker solar array), the panels will generate over 55 million kilowatt hours of clean energy over the course of the next 25 years. Over the course of a 25-year purchase agreement with Georgia Power, the solar farm will supply about 50% of the town’s power – which is roughly the equivalent of burning 3,600 tons of coal per year. During his term in office, Carter created the Department of Energy and Federal Energy Regulatory Commission (FERC), and signed the Public Utility Regulatory Act (PURPA), all catalysts for the advancement of renewable energy in the U.S. Carter was also the first president to put solar panels on the White House.